This week: learn how Lorcan O’Herlihy amplifies urbanism; celebrate at Otis College’s centennial party; admire some innovative wood quilts; see how LA artists reflect a sense of place in their city; and find your space in a garden of Calder sculptures. 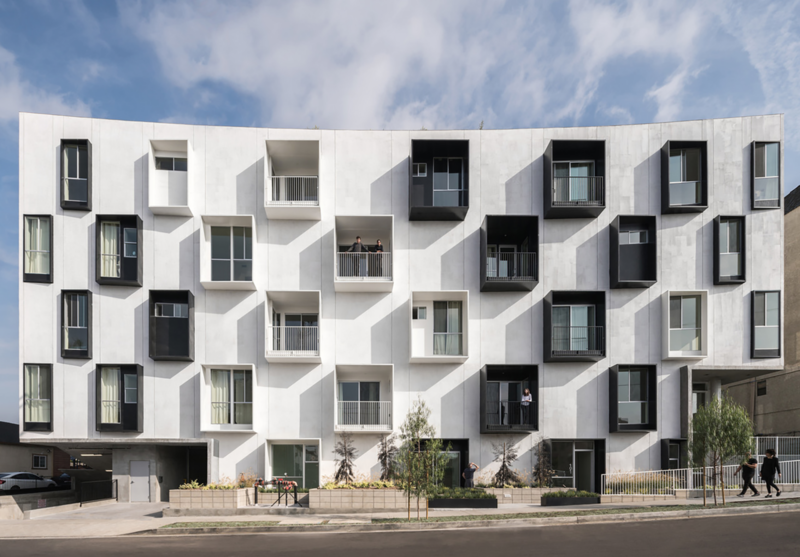 Mariposa 1038 located in Koreatown, LOHA 2017, includes landscaped courtyard and roof-top deck for enhanced public space. Amplified Urbanism relates to Lorcan O’Herlihy Architects’ (LOHA’s) design methodology of creating fluid interactions between public and private spaces, inspiring social and civic connections and harnessing existing ecological and infrastructural patterns. The exhibition and lecture Amplified Urbanism features several LOHA projects which illustrate these concepts, and address a wider discussion across the fields of architecture and urban planning in cities throughout the world. In addition, the show features a site-specific sculpture that doubles as a seating structure, so visitors can sit and view the exhibition, while being part of it at the same time. A book of the same name accompanies the exhibition. You can read more about the event here. When: Lecture Wednesday, Nov 7, 6 pm. Exhibition on view in USC’s Verle Annis Gallery through Friday, Nov 9th. This is the weekend to get inspired! 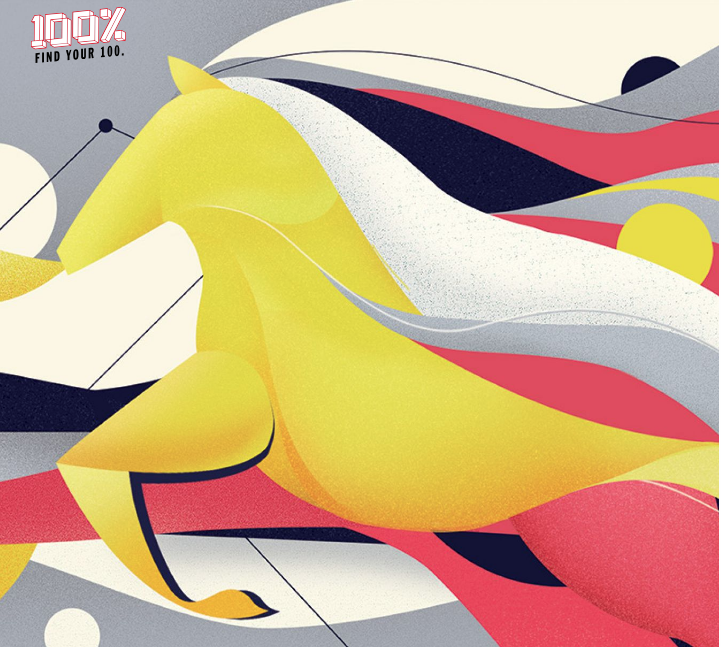 Presented in association with DeviantArt, 100% Festival at Otis College of Art and Design will feature workshops, speakers, interactive installations and a makers’ market, all with an invitation to embrace your creative side. Highlights include a conversation between fashion designer Bao Tranchi and artist Joan Takayama-Ogawa; the unveiling of a mural by Darel Carey; and two panels moderated by Justin Maller, Chief Creative Officer at DeviantArt. You can find full programming details here. And listen to the Nov 6 episode of DnA for a look back at Otis’ 100-year history. Soft and cuddly this is not, but when artist Troy Murrah combines the carpentry, quilting and engravings informed by his upbringing, the result still manages to make you feel welcomed home. The artist uses thousands of geometric wood pieces, cut from leftover found remnants, to construct elaborate wall hangings that replicate traditional quilt block patterns. Take a closer look and find detailed engravings, like wallpaper patterns. You can see Murrah’s unique creations on display through Friday at 4th Street Vine restaurant and bar in Long Beach. There’s even live music every night. You can read more about the art show here. Boundaries delineate the idea of “self” from “other,” and “here” from “there,” and while doing so, they both foster and inhibit freedom. The 16 artists assembled in Here, presented by The City of Los Angeles Department of Cultural Affairs (DCA), the Los Angeles Municipal Art Gallery (LAMAG) and Barnsdall Art Park Foundation, investigate LA’s bounded and unbounded landscapes as a way to explore the complexities of the city. 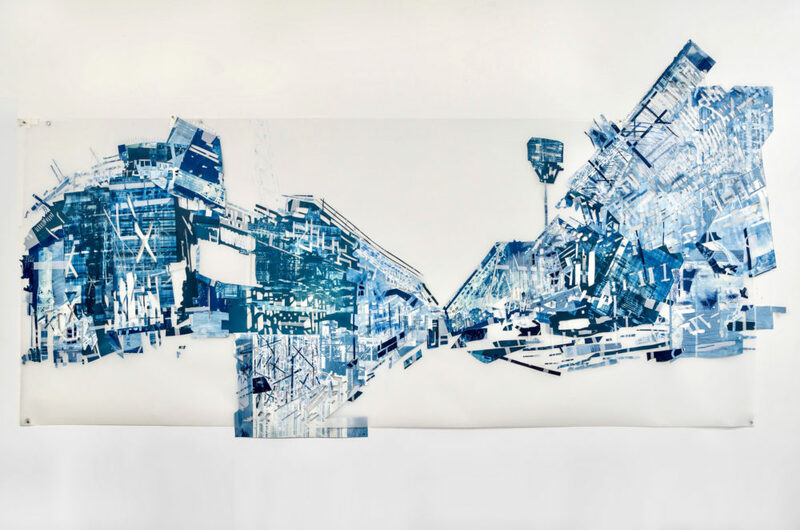 The exhibition features works by LA-based artists – some of whom are LA transplants – exploring themes such as identity, displacement, migration, race, class, state-sanctioned violence, LA neighborhood signifiers and architectural facades. Artists include Nancy Pop, known for highlighting the shifting architectural characters of neighborhoods and their impact on community; Fran Siegel, who examines the construction of the Gerald Desmond Bridge in Long Beach; Renee Petropolis, who looks at building facades; and many more. You can read more about the exhibition here. Feuille d’arbre. Alexander Calder, 1974. Installation view, Hauser & Wirth Los Angeles, 2018. Photo by Mario de Lopez. A prolific American artist of the 20th Century, Alexander Calder is best known for his abstract public sculptures and innovative mobiles, or kinetic sculptures. 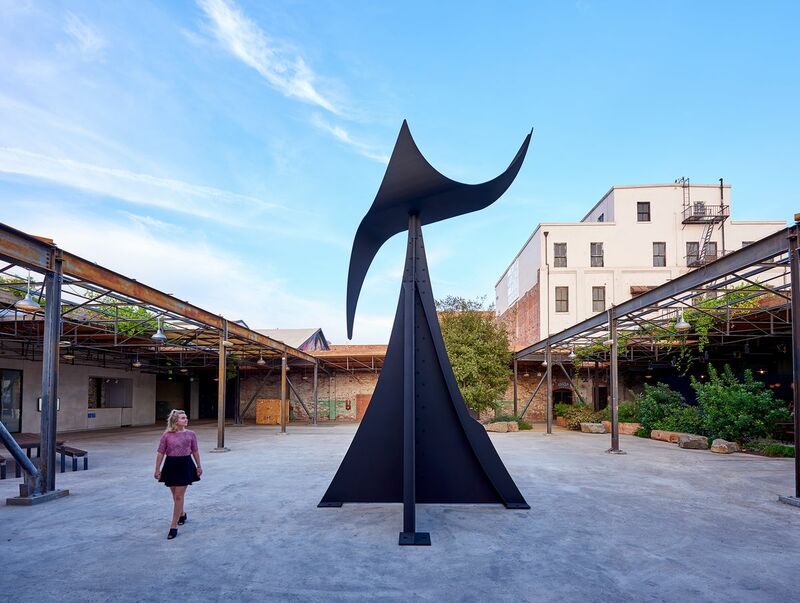 The exhibition Calder: Nonspace fills the South Gallery courtyard at Hauser & Wirth with a display of 30 primarily monochromatic sculptures. Weave through the Stephanie Goto-designed environment and you will experience the spaces and ‘nonspaces’ created by Calder’s works. As novelist James Jones said in a 1963 essay: ‘[Calder’s] stabiles (and his mobiles as well) are able to fill a given space without occupying it… He has taken a given space and, by molding beautiful elements of steel around it, caused it to become nonspace.’ You can read more about the exhibition here.